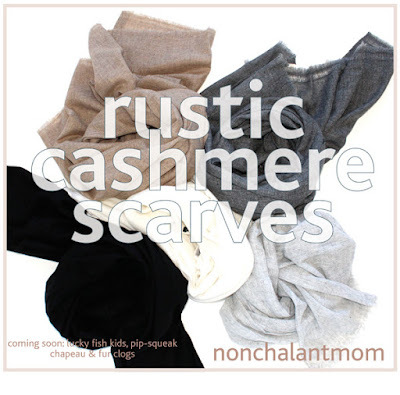 nonchalant mom: your favorite cashmere scarves are back in stock! Each season we re-stock these, what I like to call, perfect cashmere scarves. They are not huge and unruly, they are delicately light-weight and they softly keep you just warm enough! They are 80% cashmere and 20% fine merino wool (less pilling folks) and all for a deeply pleasant $98. Our colors this season are white, light grey, dark grey, medium heather brown and black. They have selvage finishings and ends are just rustic and unfinished. Have a lovely week and enjoy this delightful weather!